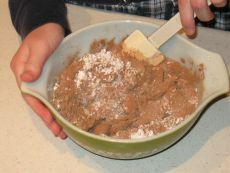 This is a great easy truffle recipe for kids because it requires no melting of chocolate. 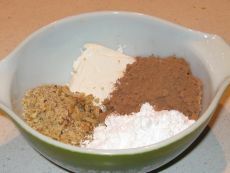 Just mix and eat! Makes 16 one inch balls. Next comes the fun part, forming into small balls. 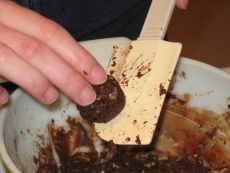 Either form as shown below with the rubber scraper or in the palm of your hand. 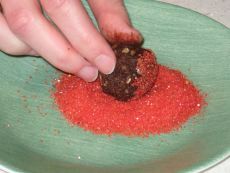 Then roll in one of your favorites: colored sugar, coconut, or chopped nuts. 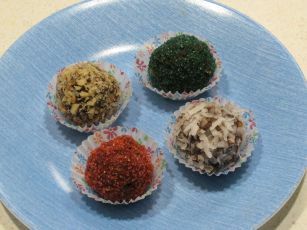 The kids liked making these because I usually had the ingredients on hand and they could easily make them by themselves. It's one of those recipes that you can just leave them to experiment with. I wonder what your truffles will be rolled in?